Can Gutter Screens Really Help You Save Money and Are They Worth the Expense? maple leaves in gutter, fall time. First of all, installing gutter guards will help avoid clogging your gutters. Even the cheapest gutter screens will successfully stop leaves and small debris from entering your gutters or damaging them. Experienced roofers at CLC Roofing say they are very beneficial for the maintaining the integrity of your roof. Indirectly, by preventing your gutters from being clogged, gutter screens can prevent costly damage from affecting your roof, the walls of your house and even your basement and foundation. Gutter guards can even prevent fires. Without any branches or other dry material being collected by your gutters, embers traveling from forest fires are less likely to be ignited and lead to possibly damaging your home quite severely. 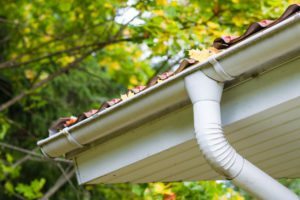 Insects such as spiders, mosquitoes and cockroaches can breed and contaminate your gutters over time, especially in the presence of stagnant water. A reliable set of gutter guards can help you avoid all that and also act as a protective barrier against mice, birds and other animals. Due to an improved flow of water through downpipes, you can easily use a rainwater tank to collect more water and speed up the collection process at the same time. Based on these facts, it’s clear to see that gutter screens are well worth the money, especially considering that they can save you from thousands of dollars worth of damage.